Twins Jay and Nia are children of two worlds and two homes. Readers can follow the siblings as they both address the difficulties of having parents who are no longer together and discover the benefits of having two very different homes to explore and enjoy. 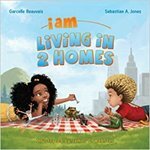 Beauvais, Garcelle and Jones, Sebastian A., "I Am Living in 2 Homes (I Am Book)" (2014). DIVerse Families. 401.